Oliver Queen is alive but the League of Assassins is closing in on him and his allies. Malcolm Merlyn is in similarly dire straits and is ready to flee Starling City with Thea in tow. As Ray Palmer continues the work on his ATOM suit, Felicity struggles with what she can and will do to help the city in its time of need. And Laurel Lance has taken to the streets in costume to take on Brick's followers. John Diggle and Arsenal are quick to try and get her to stop risking her life but when Brick takes several city aldermen hostage, they may be forced to accept her help. The Green Arrow/Black Canary comics of Judd Winick and Andrew Kreisberg. Brick says he hates hitting women. He also seems to be reluctant to shoot them, as he doesn't take two perfectly good opportunities to shoot Laurel while he has the chance. Also, he seems to have abandoned his tick of offering those who oppose him a chance to shoot him from last episode. Despite training as a boxer, Laurel seems committed to fighting with a melee weapon (quarterstaff) we don't have any evidence she's trained with. How did Felicity have access to numerous recordings of Sara Lance's voice? One wonders why Captain Lance doesn't arrest the mayor when she starts talking about literally giving a part of the city to a crime lord. It has to be a violation of eminent domain, if nothing else and it's not like he could plunge The Glades into further chaos. Colton Haynes really steps to the forefront in this episode. He hasn't always been given a lot to do as Roy Harper but he nails ever single scene he has in this episode, from his warning off Laurel after saving her life to his bonding with Diggle after their mission goes south. Even when he confronts Malcolm Merlyn, Haynes proves capable of holding his own against John Barrowman - no mean feat! The opening nightmare sequence with Ollie and Felicity is an effective bit of horror, made all the more effective by us not being aware at first that it is a dream instead of a flashback and not knowing who the dreamer is. The best fight scene of the night? The fight in the Hong Kong nightclub during the flashback. Very well choreographed and well-shot. When Laurel is threatening one of Brick's henchmen, she drops the name of Belle Reeve prison and suggests it is a much nicer place than Iron Heights. In the comics, Belle Reeve is a notable penitentiary devoted to the incarceration of metahumans. Located in Louisiana, it first appeared in Suicide Squad #1 and probably is a nicer prison than Iron Heights if only because the warden of Iron Heights in the comics was a sadist who performed illegal experiments on the metahumans in his charge. The press refers to Arsenal as "The Red Arrow". This was indeed Roy Harper's codename when he joined The Justice League. Brick claims to quote from Shakespeare's Julius Cesar - Act V, Scene 2. "They stand and would have parley." - when he calls the mayor making demands. Brick quotes the line perfectly, but the line is actually from Act V, Scene 1. The ATOM armor does not fire lasers. It fires compressed hard-light beams. Felicity is able to fake Sara Lance's voice using a symbolic algorithm and recordings of Sara's voice. The nanite chip for the ATOM armor won't function without a quantum processor. Oliver: If Ra's finds out that you saved me... betrayed him.. he's going to kill you. Maseo: Don't waste your breath on worries for me. Your concern should be for your home and what has become of it in your absence. Roy: (To Laurel) I've had training from Oliver and years on the streets. You have a law degree. (sighs) Look, I get it. This isn't how you deal with grief, Laurel. This is how yourself get killed. Felicity: And by help you mean money and counsel - not a suit powered by dwarf-star alloy that fires lasers at people? Ray: Well, they aren't lasers. That would be ridiculous! They're compressed hard-light beams. Tatsu: The line between grief and guilt is a thin one. Sometimes death is preferable to the agony of life. Roy: You need to stay away from her. I don't know why you want her to leave Starling City but I'm not letting her go anywhere with you. Merlyn: Well, thank you for that. I was in need of some humor. Roy: I wasn't joking. You're a poison. You put her in Ra's Al Ghul's gun-sites. You had her kill Sara. Merlyn: Thea knows nothing about Sara. And she never will. Roy: That's where your wrong. I know her. She'll get to the truth, no matter how well you think you're hiding it. And when she does find out that you've been lying to her, you're going to lose her forever. Trust me - I know from experience. Merlyn: This is a family matter, Mr. Harper. And you are not family. Ray: When I started The ATOM Project it was all about avenging Anna. But what it's become about is protecting the people I care for. Felicity: You mean the city? Ray: No. I mean you. Laurel: I'm not going to be putting on that mask again. I'm not strong enough to fight for Sara. Felicity: Maybe you're not supposed to. Maybe it's not about Sara. Or Oliver. Or anyone else that we care about that we've lost. Maybe what we've been doing, we've been doing because there are people we still care about who are... alive. Maybe we're doing it for them. Felicity: I need the keys to your helicopter. Ray: How would you even fly it? Felicity: I've got that covered. Can you please just give me the keys now? I promise, promise I will not crash it. Ray: I've got to be honest. I''d feel a little more confident in your aeronautic abilities if you knew, for instance, that helicopters don't actually have keys. Thea: So why run? Why not stay and fight? Seven months ago, I asked you to teach me. To teach me how to not be afraid and how to not get hurt. So why are you asking me to be afraid now? Thea: But I'm not! And my father taught me how not to be. He taught me how to stand my ground and how not to give an inch in a battle. I'm not afraid of this man and you shouldn't be either. He should be afraid of us. The opening nightmare scene opens just like Oliver's goodbye to Felicity in A309. Maseo and Tatsu are no longer in regular contact with one another. Diggle taught everyone on Team Arrow how to suture a wound. Felicity was a faster study than Roy. The current mayor of Starling City is a woman named Celia Castle. Roy refers to the events of A220 and how he was responsible for a death then as well as now. Diggle and Roy make a toast with vodka, as Diggle repeats Ollie's toast from A206 - Prochnost. He admits he has no idea what it means ("Strength" in Russian). Amanda Waller apparently suspected Maseo and Oliver would attempt to bargain for Tatsu's life with the Alpha, so she replaced it with a fake elixir. At the episode's end, we learn that Chase - the DJ Thea hired in A307 - is an assassin reporting to Maseo. A cabin in an unidentified location, within several hours walking distance of the League Of Assassins' dueling grounds. We know that something happened to end Tatsu and Maseo's marriage, but we still do not know the details... yet. 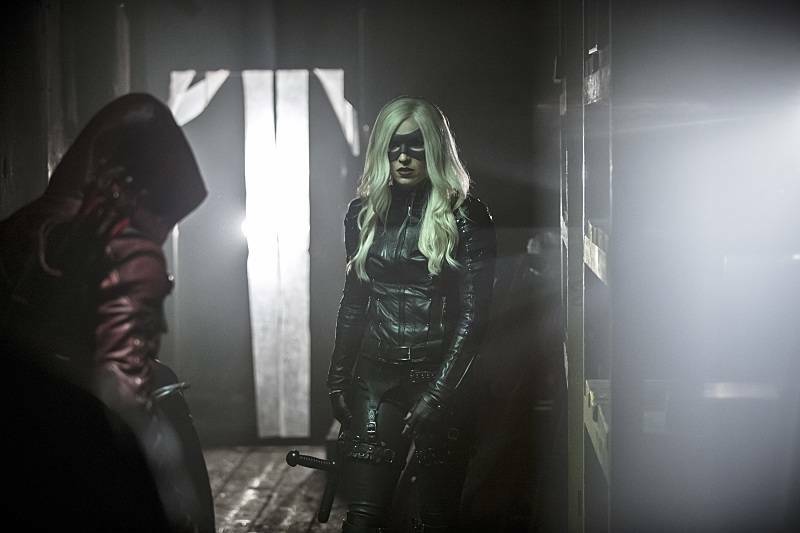 Granting that she is new to the whole vigilante thing, very little of what we see of Laurel in action in this episode inspires confidence that she will ever live up to her sister's legacy. She survives her first action scene in the episode only because Arsenal saved her. The only reason the Brick doesn't kill her several times over the course of the episode is because he says he doesn't hit women and/or forgets that he's holding a gun. And yet the largest concern is that Laurel lacks the moral fortitude to be a hero, only just now realizing that her actions are causing other people to come to harm. Much is made about Felicity being the one to encourage Laurel and eventually drag the rest of Team Arrow out of their doldrums. A shame her inspiration to do this comes from Ray Palmer's speech about why he's really making The ATOM Suit - to protect her. The entirety of Team Arrow is downgraded for much of the episode. Granting that everyone is shaken up by the possibility of Oliver's death, it still seems to be contrived to make Brick appear to be more awesome than he truly is as a criminal mastermind. Local politicians and police being made to look incompetent or corrupt is another staple of Winick's Green Arrow run. It isn't as bad as it could have been but it isn't that good, either. The script is one contrivance after another that serve no purpose other than to pump up the villain at the expense of our heroes. Paradoxically, the best bits of the episode are the ones where we see our heroes bonding together, though the scenes with Laurel interacting with the rest of Team Arrow still feel hollow as there's a presumption of relationships we haven't seen all season. The cast give it their all but there's still a feeling that we're treading water until the big finale next week.